Where would the Bulls have been without Luol Deng? Luol Deng is one of the best players in Bulls franchise history. He is in the top 10 in franchise history in 10 major statistical categories and with this being his 10th season with the Bulls tied with Jerry Sloan and Tom Boerwinkle and behind only Michael Jordan and Scottie Pippen in years with the franchise. Deng is behind only Jordan and Sloan for consecutive seasons in the starting lineup. Deng is one of 10 players in franchise history to be a multiple All-Star and one of a dozen to have been named to an all-defensive team. He’s the only Bulls player ever to have won the NBA’s sportsmanship award, a worldwide ambassador for the NBA. Luol Deng never embarrasses you or your team. He’s the league’s resigning ironman, leading the league in minutes played the last two seasons and four of the last seven for the Bulls. His story is one of the great ones in sport, a refugee from his native Sudan who grew up in England to go on to represent that country in the Olympics and one of the figures in the independence of his native nation, South Sudan. 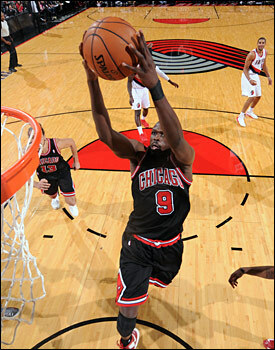 I’m glad Luol Deng is a Bull and I hope he stays one. I know the sentiment these days around Chicago that with Derrick Rose’s second knee injury and being lost for another season the team has to make major changes. I certainly understand and would not be surprised. The name that comes up often is that of Deng because he is an unrestricted free agent after this season and he and the Bulls could not agree on contract extension before the season. There was good reason for that other than his value to the franchise, and now it’s clearer again. Things change in sports and you want to maintain options. But Deng is 28 years old, the prime of an NBA player’s career. He is a valuable, versatile player. Sure, he could leave the Bulls as a free agent. But LeBron James could leave Miami. So could Dwyane Wade. Carmelo Anthony could leave the Knicks. It’s part of the NBA business now. But I’m not giving away Luol Deng considering his value, and every season is worth playing, and playing seriously, no matter whether the ultimate goal of a title is achievable. The Bulls are back to business in Detroit Wednesday, and Deng earlier in the day before the team’s morning workout was asked about these rumors and demands and suggestions of transactions hanging over the team in the wake of Rose’s injury. The storyline is the Bulls are no longer a title contender without Rose. So get whatever you can before players like Deng and Hinrich can leave as free agents. On some level it perhaps could be taken as an insult given the team did so well last season not only without Rose, but with the constant uncertainty of whether he’d return and when. But Deng, again, said you have to roll with these things in the game even if you could tell it does hurt. Obviously, the shock of Rose’s injury hit the team hard as they played the Clippers Sunday and then in Utah Monday. They recovered some in Monday’s game against a young Jazz team to get to overtime. Now, they are back in the Eastern Conference with the Pistons and in Cleveland Saturday to end the long road trip. It was the sort of month, even if the team never can say they, where the hope was playing .500 ball. And that was with Rose. The schedule begins to turn in December and January with a majority of home games. Not that anything will be easy anymore without Rose. The offense is generously a work in progress. Bulls coach Tom Thibodeau said he’ll again start rookie Tony Snell against the Pistons with the hope the team improves its three point shooting, five of 25 the last two games. “We’re going to start Tony again tonight,” Thibodeau said. “Hopefully, he can continue to improve. I thought he made some good plays in that game. His defense, I thought, was very good. I thought he got some good looks. I think he’ll knock those shots down. He’s got to be able to knock shots down for us. So, yes, it will be the same formula. Play defense, rebound, keep the game close and hope someone gets a good shot late and it goes in. Deng is a guy who can do that. He came up short against the Jazz, but in drawing defense to him, Carlos Boozer missed a short putback which would have made this trip a lot better. So the Bulls have lost four straight as they move on. “We need practice,” said Deng about going forward without Rose. “We’ll change a few things offensively. We’re going to depend on our defense and our rebounding to get it done. I don’t think there will be a lot of new stuff. There’s almost an entire season ahead and an Eastern Conference in which the Bulls should be competitive. It would help having a player who is fifth on the franchise list in points scored and field goals, sixth in three pointers, fifth in defensive rebounds and ninth overall in rebounds, fifth in steals, 10th in blocks, and should Deng finish the season with the Bulls third all time in games played behind only Jordan and Pippen, one of the great Bulls players of all time.